Mild yellow mustard, relish, chopped onions, tomato wedges, a pickle spear, sport peppers, a dash of celery salt and a jumbo-sized charred dog — all nestled inside a fresh poppy seed bun. At Evanston’s newly opened Chicago Hot Dog and Co., they get the basics right. After helping to manage the Taste of Chicago festival for 12 years, Waseem Bhimani finally decided to create a permanent venue from which to serve his version of the classic Chicago hot dog. The restaurant opened in mid-August at 1009 Davis St., replacing Yeero Revolution which closed earlier this year. Laura Brown, Downtown Evanston’s business development and marketing manager, said the restaurant’s varied menu options make it a good addition to the area. The space itself is small. The white brick walls, bright red metal stools and exaggerated ‘50s-style mural of the Chicago landscape provide a slightly more modern take on the old-timey diner aesthetic. Bhimani said his hot dogs are “locally sourced” and “handcrafted.” He also gets all his condiments from community suppliers. He added that the dogs are charred using a charbroiler instead of a flat-top grill, to add a personal touch that he said reminds him of his childhood. “It’s a memory I’ve had since being a kid, going to baseball games at U.S. Cellular Field,” Bhimani said. 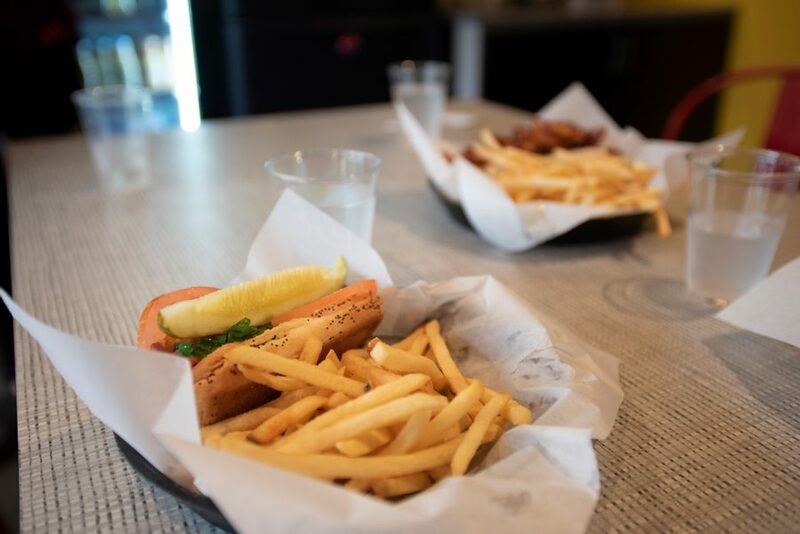 While Chicago Hot Dog and Co.’s staple is the Chicago-style dog, the menu extends beyond hot dogs and fries. The restaurant serves everything from gyro burgers to avocado toast to funnel cake for dessert. Bhimani said he worked for about six months to perfect the wide-ranging menu. Bhimani said his restaurant’s variety of dishes, as well as the quality of ingredients, have helped Chicago Hot Dog and Co. accrue a group of loyal regulars in the short month and a half it’s been open. Fourth-year graduate student Rustin Golnabi — who has eaten at the restaurant twice since its opening — said while the main course he ordered was delicious, the heap of fries it came with was even better. “I really loved the fries. They’re crispy, fresh and thin cut,” Golnabi said.